Module 12: Who Says Women Can’t Be Doctors? Stone, T.L. (2013). Who says women can’t be doctors?. New York, NY: Christy Ottaviano Books. Genre: Non-fiction, picture book biography. 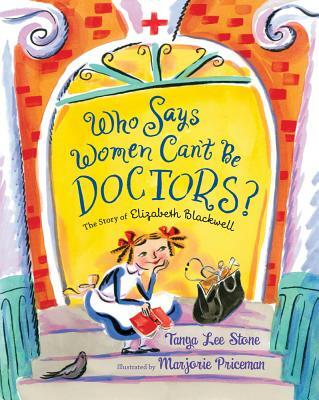 Book Summary: The story of how Elizabeth Blackwell grew up (generally speaking), scientifically-minded, and was encouraged to be a doctor by a friend. However, she met with incredible resistance from the medical community (sucah as it was in the 1840s), but with support and encouragement from her family, finally found a medical school to accept her. She studied hard, graduated at the top of her class (had she done less, she probably wouldn’t have had any respect), and became a respected doctor (among women), paving the way for other women to get medical degrees. Impressions: I enjoy stories about women overcoming obstacles (and there are so many for us to overcome!) but I really enjoyed the way that Stone approached this. It’s basic enough that a four-year-old could understand it, using simpler sentences and smaller words but still getting the point — that Blackwell had to overcome obstacles in order to become a doctor — across loud and clear. The illustrations help, especially on the two-page spread when Blackwell is getting her rejections: the “nos” (and there are 28 of them for each of her 28 rejections) cover the page, over a picture of Blackwell looking dejected. And then, turning the page, Elizabeth his jubilant with a huge “YES” next to her. It’s very effective. The book only goes through Blackwell’s graduation from medical school, but author’s note at the end detailed the rest of her life, and the works she did for women’s health and to encourage other women to go to medical school. Review: New York Times book editor Pamela Paul reviewed a collection of books for Women’s History Month, including this one, which she called “[a] sharp, witty biography”, praising Stone for her approach to Blackwell’s life, noting that it engages the modern reader by beginning with “You might find this hard to believe, but there once was a time when girls weren’t allowed to become doctors.” She also praises Priceman’s goache (I learned a word: a goache is an opaque watercolor, one type of watermedia, paint consisting of pigment, water, a binding agent (usually dextrin or gum arabic)) illustrations, writing “Petersoninfuses her bright gouaches with energy and dynamism. (They’re also awfully pretty and appealing. )” Overall, it was a glowing review. Uses: This one is simple enough to use in a pre-school storytime (though I’m not sure how well they’d understand it; parents would enjoy it though), or on a display during women’s history month, or a general feminism display. Mary Walker Wears the Pants: The True Story of the Doctor, Reformer, and Civil War Hero, by Cheryl Harness, illustrated by Carlo Molinari – Another story, just as well written, about a woman doctor — Mary Walker, who practiced in the 1860s — who was a women’s rights advocate, an abolitionist, and got arrested for wearing pants (she refused to wear dresses). She eventually became the first woman assistant surgeon for the U. S. Army. Mae Among the Stars by Roda Ahmed, illustrated by Stasia Burrington – The story of Mae Jemison, who became the first African American female astronaut at NASA, flying the space shuttle Endeavor. The book is about her path to becoming an astronaut: the obstacles she faced (not only as a woman, but as an African American), and how she worked to overcome them with determination and intelligence to succeed at her dreams. Shark Lady: The True Story of How Eugenie Clark Became the Ocean’s Most Fearless Scientist by Jess Keating, illustrated by Marta Álvarez Miguéns – This one follows a similar theme: Clark was captivated by sharks as a child, was discouraged from becoming a marine scientist. She eventually became known for her work with sharks, as well as discovering several new species of fish.